Today was a catch-up field trip. Well, almost. To say it was a catch up is not entirely precise – my course have not yet visited Herodion. However, I do already know that I won’t be able to make the scheduled visit for my course, so I was catching-up in advance, if that’s possible. 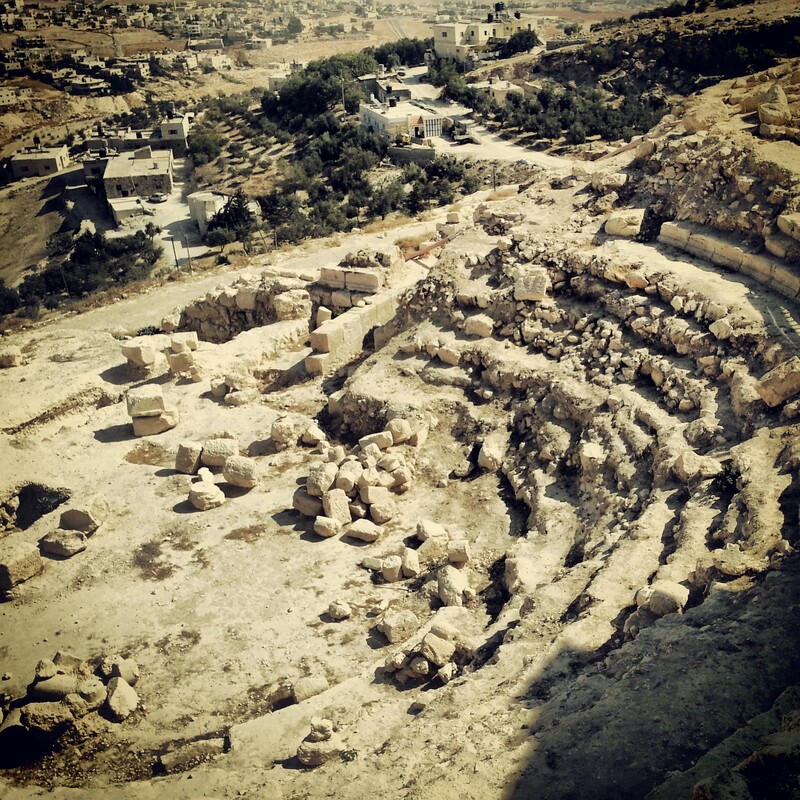 Herodian is nestled in the West Bank not far from Jerusalem and Bethlehem. Here, so we believe, was the final resting place of Herod the Great, the master builder of Israel, although by all accounts also quite a tyrannical ruler. The trip came at bad timing for our guide following the publication of an academic article suggesting that the sarcophagus identified as belonging to Herod is not in fact his; still this remains a minority view amongst the experts. The site used to be rather tricky to access but since the opening of a new road around 8 years ago it is only 15 minutes’ drive from Jerusalem city limits and there has been an explosion in tourism – we were at the site with around four other groups. As with our other trips to the West Bank, I found it strange to look out over the mix of Palestinian and Jewish settlements dotting the landscape. It seems so peaceful, tranquil, calm. If you didn’t know that there was a conflict here, there would be no way of picking it up. But still it is a little unnerving to have that knowledge that under the peaceful facade lie many political tensions. Similar to his other construction sites in the Judean desert, Herod built a magnificent palace/fortress here with an incredibly impressive water system; huge cisterns, bath houses, pools. It is actually the only of his fortresses which he entirely built himself – the others were all based on Hasmonean remains. Perhaps this was why he chose this as his final resting place – it was after all entirely his. Passing the bathhouse and pool at the foot of the slope, we ascended to the upper fortress. Our guide told us how at this site, prior to any buildings being present here, Herod had defeated his enemy Antigonos for the first time in battle, having been chased out of the Galilee and Judea. This, together with its convenient location in between Jerusalem and Masada, may have been a reason for constructing the fortress. We delved into the psychology of Herod, a man who had to show that he could achieve anything, a man who was paranoid about another insurrection; scarred by the experience of his family who nearly died of thirst while under siege. A man whose popularity was not widespread; on hearing that Herod had killed his own son, the Caesar Augustus is said to have remarked that he ‘would rather be Herod’s pig than his son’. We explored the various stages of building at the site. The current theory is that a large palace and fortress were constructed; later Herod decided that he would be buried here so he built a mausoleum together with a theatre for his funeral ceremony and covered the rest of the structure in earth. We heard the sad story of Ehud Netzer, the archaeologist who dedicated his life to excavating Herodion and finding Herod’s actual tomb on the site. Having finally done so, he fell to his death shortly afterwards after leaning on a fence that collapsed. This was only a few years ago and his presence is very much still felt at the site. Later, rebels against the Roman regime in both the Great Revolt (which ultimately lead to the destruction of the Second Temple) and the Bar Kochba Revolt used the site, converting a reception room into a synagogue, building ritual baths and turning the impressive water system into a series of tunnels to assist them in guerrilla warfare. We descended through these tunnels to the theatre believed to have hosted Herod’s eulogy. 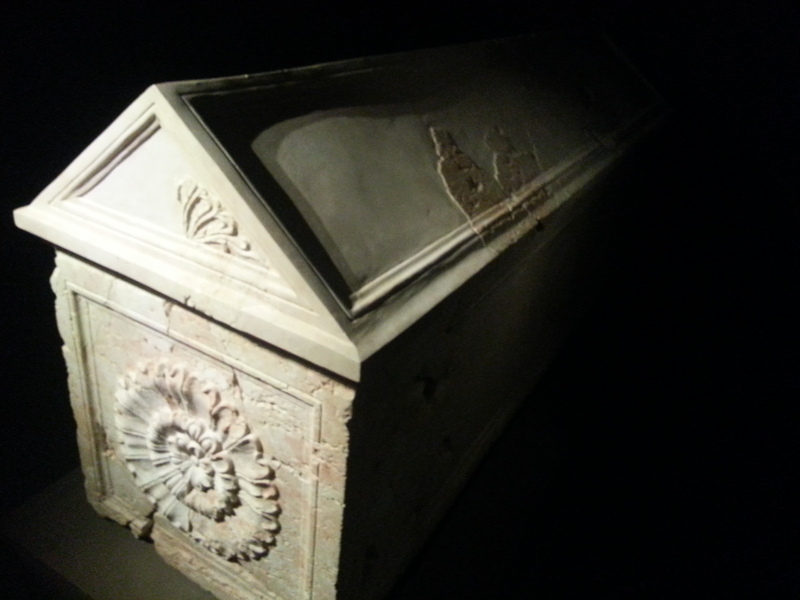 We did not go to visit the mausoleum, as it is currently in the Israel Museum for its huge exhibition on Herod. However, we were able to enjoy a very good film recreating the events around Herod’s death and his funeral procession, based on descriptions in Josephus. With the rest of the group heading off to Susya and Hebron, sites I had already visited, I took my leave at Gush Etzion, just about managing to get back to Tel Aviv for lunch and catch up on my blog!